Dual-energy x-ray systems significantly enhance the detection of thin contaminants, says Anritsu. 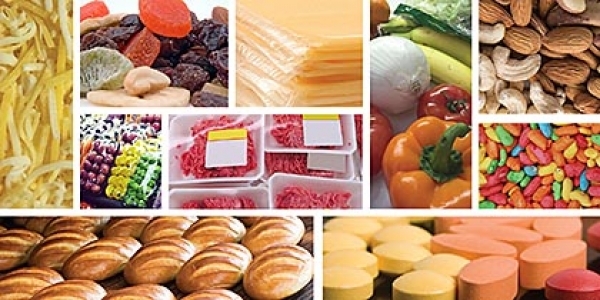 X-ray systems have been used in food factories as an inspection solution for over 20 years. 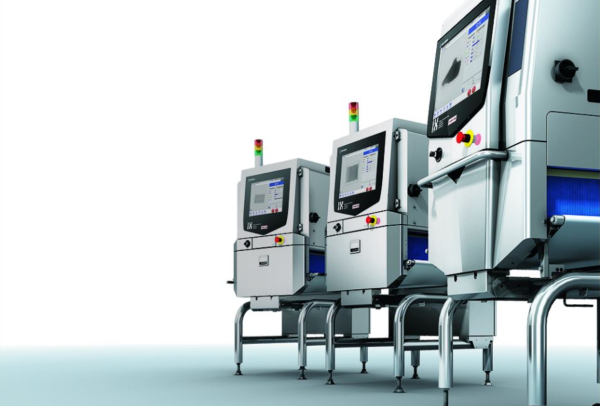 Since x-ray inspection systems can monitor contamination of hard materials—other than metal contaminants—they are ideally suited for today’s food production factories. As a result, x-ray systems have become reliable inspection equipment, after metal detectors. 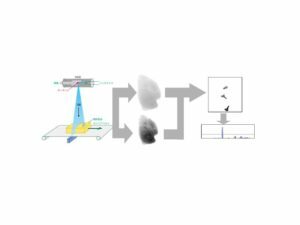 However, it becomes difficult for conventional x-ray inspection systems to provide enhanced detection sensitivity for hard-to-detect contaminants or foreign objects described in this article. In order to overcome the limitations on the performance of conventional x-ray inspection systems, the dual energy x-ray inspection system was developed. In conventional x-ray inspection systems, image processing is applied to an x-ray transmission image using single x-ray energy to identify contaminants. This method offers accurate detection of contaminants with high density such as metal that are low in the transmission level. Foreign objects softer than metals can be identified easily by applying image processing if there is enough difference in x-ray transmission level between foreign objects and the product. However, detection of foreign objects becomes difficult when both contaminants and product have the same x-ray transmission level or foreign objects exceed the product in x-ray transmission level. It is like contaminants shown in light gray color are being covered by the product shown in black color. A typical example of those contaminants is bones embedded in the meat. Among those bones, high-density bones of beef or pork can be captured in an x-ray image by using single x-rays with long wavelength; however, bone fragments in poultry cannot be captured with long wavelength since they have extremely low density which leads the x-ray image of the bones to be hidden under the image of the meat. 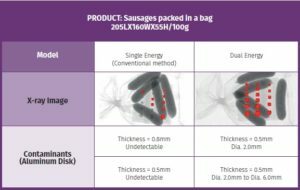 Moreover, sausages in a bag can be overlapped inside the package so that distinguishing foreign objects from an x-ray transmission image using the single-energy method can be difficult. 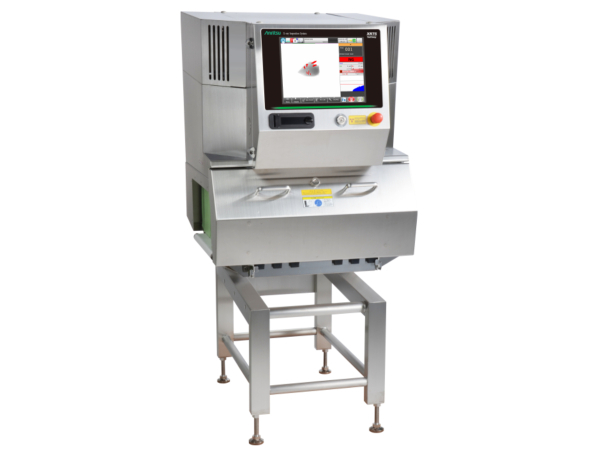 Dual-energy x-ray inspection systems are developed to deliver stable performance in detecting contaminants in bone fragments in poultry as well as overlapping products. A dual-energy sensor receives high and low x-ray energy levels to generate x-ray transmission images. X-ray transmission images are combined (finite difference) to reduce the effect of product. In the ideal condition, the image of the product disappears at this point. If there is any foreign object contaminated in the product, it appears in the x-ray image when the effect of product is being reduced. This is because x-ray transmission levels differ depending on the magnitude of x-ray energy and the type of substances. Practically, the image of the product does not disappear completely from the combined image. Analysing two different x-ray energy signals allows the system to distinguish contaminants easily; therefore, detection sensitivity for contaminants is enhanced. The first example uses a small aluminum disk—an object that is hard-to-detect by x-ray inspection systems. 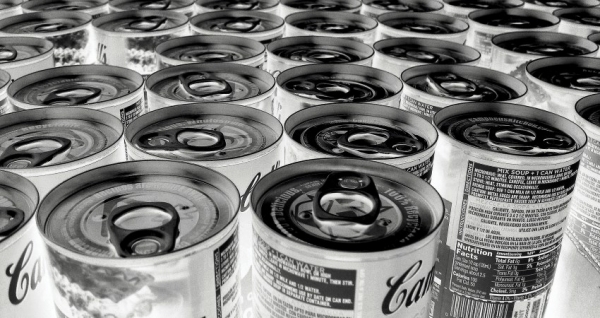 Aluminum is a metal that can easily transmit x-rays and is hard to be generated in an image; therefore, it serves as an important indicator for evaluating the performance of x-ray inspection systems. 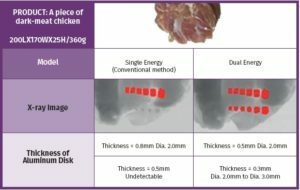 Fig.1.1 shows the image of dark-meat chicken with aluminum disk test pieces at a thickness of 0.3 mm and 0.5 mm. These test pieces come in six types: a diameter of 2.0 mm, 3.0 mm, 4.0 mm, 5.0 mm, 6.0 mm, and 8.0 mm. The dual-energy system detects all types of test pieces mentioned above with a thickness of 0.3 mm and 0.5 mm. The single-energy x-ray system detects a test piece with a thickness of 0.8mm but is unable to detect a test piece with a thickness of 0.5 mm. In some cases, pale grey of test pieces with a thickness of 0.5 mm can be identified only by visual observation on the x-ray transmission image with the single-energy x-ray system; however, it cannot identify the test pieces as contaminants automatically. As shown in the figure below, the x-ray system with dual-energy technology significantly improves the detection performance of low-density contaminants, which was difficult to identify with single energy x-ray systems. Further, performance evaluation can vary by meat characteristic and thickness but there is a strong possibility that low-density bones are still embedded in poultry meat if an x-ray system only detects a test piece with a thickness of above 1 mm. In most cases, we found remaining bones in the meat upon manual examination. We have received comments from poultry processors that they are very surprised to see so many remaining bones in the meat after implementing dual-energy x-ray systems in their production lines, which made them think that they have been very fortunate to receive no complaints from consumers when using single-energy x-ray systems and that they can never go back to the previous inspection method. A second case example is sausages packed in a bag. Sausages can easily overlap each other during the inspection. Thus, adjusting the inspection limit value in consideration of overlapped sausages is required when using a single-energy x-ray system. For this reason, detection sensitivity of contaminants can greatly differ according to whether sausages are overlapped or not. Fig.1.2 shows the comparison of detection performance between a single-energy x-ray system and a dual-energy x-ray system using an aluminum test piece that is considered to be a hard-to-detect substance. In the test, using a thin aluminum disk test piece, the dual-energy x-ray system shows outstanding superiority in detection sensitivity. 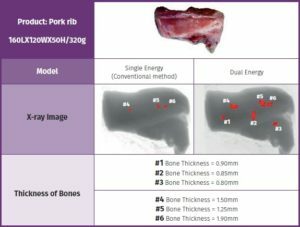 In the third example, pork rib is used to compare detection sensitivity of bones between a single-energy system and a dual-energy system. As shown in the Fig.1.3, the single-energy x-ray system is capable of detecting pork rib bones with a thickness of more than 1 mm. However, when bones in pork rib become thinner in thickness, x-rays pass through them excessively, which makes it difficult for the single-energy system and even human eyes to distinguish the difference between meat and bone. In contrast, the dual-energy system is capable of identifying bones with a thickness of less than 1 mm. As for the detection of bones #4, #5, #6 used in this example, the dual-energy system detects bones and captures the whole part of the bones. 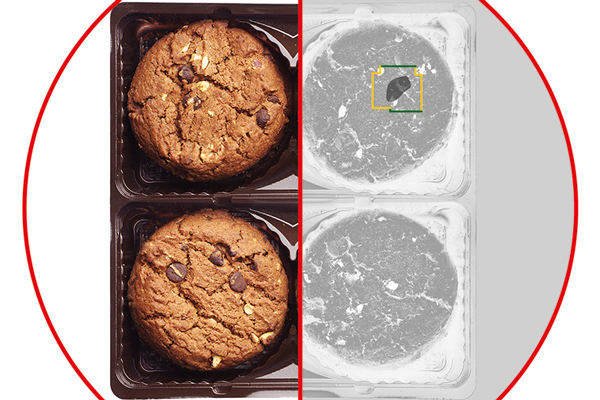 This result shows that the dual-energy system remarkably improves detection probability of bones in the meat as compared to the single-energy x-ray system. Dual-energy x-ray systems significantly enhanced the detection of thin contaminants that can easily transmit x-rays. The case examples of the detection of thin metals and bones in meat explained the advantages of dual-energy x-ray systems. However, when the thickness of the product exceeds certain levels, the x-ray transmission amount is reduced so that a dual-energy x-ray system cannot properly deliver detection sensitivity for contaminants. It is vital for users to fully understand the features and performance of x-ray inspection systems for proper operations.